You’ve raised your children together. You’ve celebrated multiple career moves and a host of double-digit anniversaries. You know what the other will order for dinner and often clean each other’s plate. Then one day something shifts: He has a stroke that leaves him unable to get out of his favorite chair without assistance—but your health hasn’t changed. You can’t imagine ever leaving his side. And yet, living together is becoming increasingly challenging. Now what? Many are turning to a CCRC (continuing care retirement community) to meet the different needs of each spouse. Of course, not all care needs arise suddenly. Sometimes health declines in subtle ways. When one spouse begins to neglect his or her own care to help the other, daily living can become a struggle for both partners. It’s important to discuss the changes openly and heed the advice of doctors and family when it comes to long-term care. You may find a solution that allows your spouse to get some extra help without straying too far from your side. Although men and women are equally likely to decline as they age, gender does affect how they deal with it. “Caregiving has traditionally been the woman’s role, and because women typically outlive men, it’s common for women to handle that task,” Fruhauf says. But more men are also caregiving today, Fruhauf says, and their approach is different. A study from the International Journal of Alzheimer’s Disease found that male caregivers of wives with dementia reported feeling a lower burden than wives who were taking care of husbands with dementia, but the same levels of depression and loneliness. 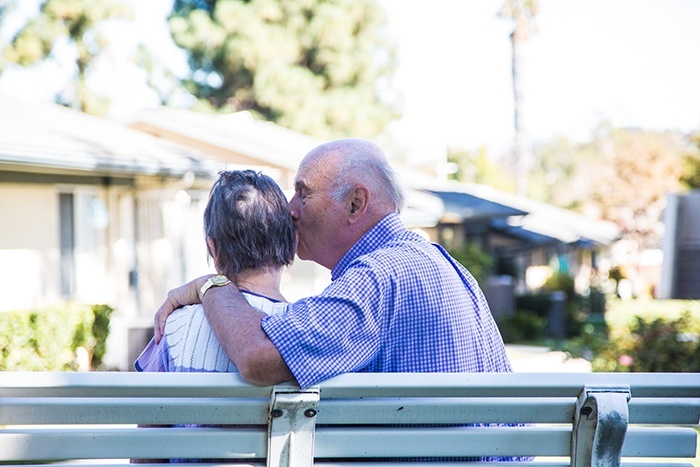 Men also often take longer than women to adjust to a spouse’s move to a higher level of care, says Nancy Kress, a licensed clinical social worker and director of social services at Redwood Terrace. “It’s important that the independent spouse has a life,” Kress says. Of course, it doesn’t have to be as black and white as caregiving at home versus sending one spouse away to live in assisted living. A continuing care retirement community (CCRC) allows both spouses to live on the same campus and receive different levels of care just steps away from each other. CCRCs offer multiple levels of care such as independent living, assisted living, skilled nursing and memory care. Spouses may move together into assisted living, or one may stay in independent living while the other receives a higher level of care. Kress tells about one couple in which the husband moved into assisted living at Redwood Terrace and adjusted quickly. His wife, who remained in residential living, felt worried and guilty about the new arrangement—but his declining health required physical support that she knew she couldn’t provide. Community staff listened to her concerns and care preferences, and eventually everyone achieved greater peace of mind by working as a team. “Caregivers need to realize that they may be grieving the loss of a future,” Fruhauf says. “Professional help can show them how to deal with the grief and loss that comes from being more of a caregiver than a partner.” Counseling resources could include support groups at long-term care facilities or adult day care programs, local Alzheimer’s disease chapters or individual counseling. The important thing is to reach out for that help when you need it. Waiting until the situation worsens can make a move more difficult.